We interrupt our normally scheduled political commentary to bring you this special public service announcement. If you're thinking of doing some traveling this holiday season or perhaps maybe in the new year then you may be looking for some cost efficient ways to get out there and see the world. Being the smart shopper that you are, this might prompt you to search for various deals on travel websites. And maybe, just maybe, it might prompt you to take a deal on Groupon for a certain business entity going by the name of "Resort Stays Voucher." Do yourself a favor: don't do that. You may recall last year I suffered through the indignity of flying with the mom-and-pop-shop bootleg franchise known as Spirit Airlines. I suffered through that indignity so that you won't have to. Once again I have suffered through another indignity on your behalf so listen to me closely when I tell you that you want no part of Resort Stays Vouchers. If you've never heard of them then GOOD. Consider yourself lucky. Less damage for you to erase from your memory later on. If you have heard of them and, worse yet, if you're actually considering using them for your future travel plans then stop what you're doing and pull up a chair because boy have I got a story for you. Prior to my recent vacation this year I had never even heard of Resort Stays. My sister, being the thoughtful and generous sister that she is, came across a deal on Groupon for a Resort Stays travel voucher and decided to buy it for me because she knows that I needed a vacation and that I like to travel. It seemed like a good idea at the time. And after all, who could fault her - if it's on Groupon then it must be legit, right? Little did I know of the headache that lay in wait for me. 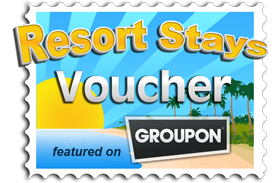 Restort Stays advertises travel vouchers either on Groupon or other similar websites which offer a multiple-night stay at some luxurious yet unnamed resort or hotel somewhere in some great part of the world that you'd like to visit for a very low price, usually around $300-$500 bucks. So that's the hook. You, the consumer (also known in hustler parlance as "the mark") say to yourself, "hey, 7 nights at a resort for $300 bucks??? Wow. Where do I sign up?" And so you buy the "voucher" which, by its terms, must be used within 1 year or else it becomes void. In theory, the way it is supposed to work is that you will go on to the Resort Stays website (SEEN HERE), enter the ID number on your voucher and -- voilà!!! -- you will have access to all sorts of awesome hotels and resorts in the most exotic parts of the globe and they will all, of course, honor your voucher. As with most things in life, how it is supposed to work in theory seldom ever matches with how it actually works in real life. We regret to inform you that your travel voucher cannot be redeemed at this time. Unfortunately, although you may have paid Groupon and/or Resort Stays Marketing (Charles Thompson) for your voucher, we have not been paid per our service agreement. Obviously, it is not possible for us to service vouchers under an agreement that has been breached. After repeated payment delinquencies and extensive collection attempts, we have been forced to initiate legal action to resolve this matter. In the event we are successful resolving this matter, we will recommence servicing vouchers. Please note: This issue has nothing to do with any destination hotel or resort property, as those properties are not a party to the breached agreement. This issue is a direct result of the voucher service agreement with Resort Stays Marketing (Charles Thompson) being breached by Resort Stays Marketing (Charles Thompson). We regret any inconvenience this may cause to purchasers. At this point, I contacted both Groupon and Restort Stays via e-mail and wrote a nice long letter full of great legal terms and words like "unacceptable" and "litigation." Groupon contacted me immediately, however they basically took the position that it was a Resort Stays problem. Resort Stays also contacted me immediately via e-mail and confessed that the notice above was written by a former disgruntled employee (which is still up on their website 6 months later for some reason???) and offered me a new website to visit where I could redeem my voucher. So I go to this new website and input my voucher ID and, naturally, it doesn't work. Once again, I contacted Resort Stays via e-mail and informed them that my voucher ID was not being recognized on the "new" site that they just forwarded to me and they apologized for the inconvenience and told me to wait a day while they fixed the problem. The following day I was finally able to log on to the "new" Resort Stays website and input my voucher ID without any pesky error messages. However, once I finally got to peruse the site I saw that their hotel/resort "selection" was basically a half-step above the Motel 6. In fact, I've stayed at some Motel 6's with better amenities than the selection being offered by Resort Stays. It was quite remarkable, actually, when you think about how one group managed to find all of the absolute cheapest and most run-down hotels/resorts in every possible city in America and around the globe. I mean, even statistically speaking they should have thrown in an occiassional 4-star hotel by mistake. But no. Not Resort Stays. Consistently low-class all the way, buddy. None of that 4-star nonsense here. And if you want to "upgrade" to an actual nice hotel then you have to, of course, pay Resort Stays a couple hundred additional dollars. Awesome. So after sifting through the reams and reams of low-budget hotels that I've never heard of I settled on a "nice" hotel for a small upgrade fee, of course. I booked the hotel through the Resort Stays website, paid my additional upgrade fee (to a Pay Pal account by the way - red flag #123,537 that I was dealing with a suspect company) and received an e-mail confirmation from Resort Stays. So far so good, right? Sort of. A few months go by and before I knew it I found myself within a few weeks of my vacation date. Out of an abundance of caution, I decided to call the hotel directly just to make sure that everything was ok with my reservation that I made through Resort Stays. So I got the hotel on the phone, gave them my name and politely asked them to confirm my reservation. Reservation? What reservation? We have no reservation listed under that name. I tried hard not to think about the fact that I had already purchased non-refundable airline tickets. So I gathered my wits and told the hotel "could you please try looking under 'Resort Stays' as I booked the reservation through their website so perhaps it's listed under their name." In other words, Resort Stays took my "upgrade fee" money ($300 bucks, by the way), pocketed it, and did absolutely nothing in terms of reserving my hotel room. Now I'm heated. Up until this point my only interaction with Resort Stays had been by e-mail. I searched their website for an actual phone number so that I could get somebody in real time to answer for this foolishness and correct the problem. Here's where it really gets interesting. Resort Stays has a number listed on its website ((877) 302-5546) and when you call it you get an automated voice machine as you might expect with most companies these days. Usually you can bypass this by pressing "0" for an operator who is a real live human being who can then direct your call to a customer service representative, yet another real live human being. However, with Resort Stays there is no operator when you hit "0" and, more importantly, there is no customer service representative. In fact, out of all the numerical options you are given when you call, you NEVER get a live person no matter which numbers you press. Ever. Believe me, I've tried them all. Each path will lead you to a computerized operator who sounds like an old-school speak & spell because the words and the tone don't match. This "operator" will then tell you something like "Hi, you've reached the personal assistant for 'social media and marketing'...'social media and marketing' is not available at the moment...sending you to voice mail." And even if you do leave a voice mail, nobody will call you back. It's as if some kid half-way around the globe is running the entire operation out of his basement from his laptop. The only way I was able to resolve the situation was by resorting back to the same Resort Stays e-mail address that I had used before and telling the person about the reservation issue. By sheer luck, the hotel just so happened to have vacancy during the dates that I had originally requested several months ago when I first booked my reservation through Resort Stays. So this story has a quasi-happy ending. Had the hotel been occupied, however, I hate to think about what type of recourse I could have possibly had against a phantom business that only communicates through e-mail. Do yourself a favor and don't find out. Moral of the story - Friends don't let Friends use Resort Stays Vouchers.